Customers' behaviour and needs are changing. 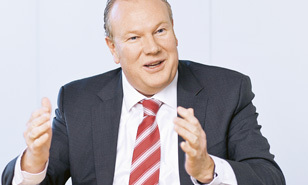 Swiss Post has taken account of such changes – with a wide range of services and an extended choice of access points. A multi-channel specialist, Swiss Post ensures the safe and reliable shipment of a wide range of consignments such as letters, small goods and promotional mailings, newspapers and confidential documents – either physically or digitally as required. Swiss Post also digitizes documents such as incoming post for public authorities and companies, and can handle entire business processes in document solutions where needed. 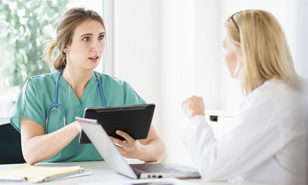 Vaccinations, diagnoses, prescriptions and more: in the electronic patient record, patients and authorized carers and physicians can access this and other data. The more comprehensive the information, the more practical it is for all parties. In the near future, all Swiss voters should be able to vote online in elections and referendums. Swiss Post is working with interested cantons to develop an e-voting platform that uses the latest technology and meets the most stringent security requirements. Postal voting in elections and referendums is popular with Mr and Mrs Swiss: more than 80 percent of all voters prefer to place their vote in the letter box than in the ballot box. In the run-up to national votes in particular, this is a major challenge for Swiss Post: shortly before any ballot, municipalities and cantons send out five million consignments to voters with information on voting and other materials. At UBS, undeliverable letters returned to the sender used to involve a great deal of effort and expense. Thanks to its use of the data matrix code, the big bank now receives hardly any physical returns. A major tour operator sends out a mailing to its customers. Customers who wish to have a consultation or a catalogue can express their interest with the enclosed business reply label and arrange an appointment. If the tour operator uses the new business reply label with data matrix code product, they benefit from a modern design, a large advertising zone and improved options for response management. In the first stage, the business reply label data matrix code is only available for standard format (card or envelope) within Switzerland. 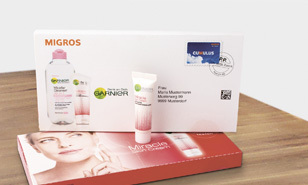 Whether it's books, pens, gift cards or mobile phone subscriptions – Swiss Post generates half a billion francs annually with sales of third-party products. “That's something we can't do without,” says Daniel Verri, Head of Marketing at Post Offices & Sales. 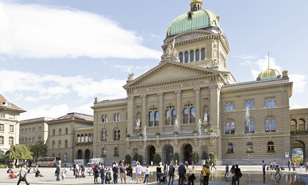 Swiss Post will in future focus the range of third-party products available at post offices more clearly on products that are related to Swiss Post – such as public services, insurance companies, or products and services in the telecommunications sector. The minikiosks offering sweets and snacks will be discontinued. It's easy to overlook something when you empty your letter box. This means that for companies, it is essential to stand out. For example with a striking and unusual consignment. A clerk at an insurance company wants to confirm receipt of a notification of claim and has finished the letter. Instead of choosing his office printer in the print dialogue, he simply clicks Print & Send. When are the school holidays in your region? Are there any industry events, trade fairs or other local events this summer? For a direct marketing campaign to be successful, it's important to choose the right time for mailing. You can find all the dates you need to know at a glance in Swiss Post's handy DirectCalendar, sorted by country, region or canton. The print version of DirectCalendar for Switzerland is available free of charge, or online with 19 other countries at www.swisspost.ch/directcalendar. The online version also has sophisticated filter functions you can use to display only the most promising dates. The automation systems of the future are intelligent. They will learn new skills themselves. These groundbreaking technologies will bring big potential savings for companies – and open up new business areas for Swiss Post. Employees of Deutsche Bahn can now settle their travel expenses using an app on their smartphone. The company is modernizing its travel expense system and creating an attractive alternative to the old process. 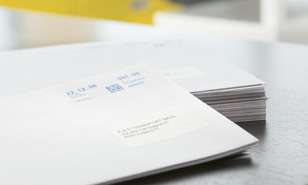 Invoices for treatment costs, notices of termination, changes of address, accident reports or requests for reimbursement: EGK, the pioneer among Swiss health insurers in terms of equal opportunities for conventional and complementary medicine, receives around one million documents every year in the post. How can such a huge volume of information – in some cases particularly sensitive health data – be processed efficiently? Swiss Post Solutions developed a time-saving hybrid solution for EGK: before delivery to the EGK offices, the local post office triages the consignments to be sent to EGK physically and those to be sent to the Swiss Post Solutions Service Center in Kriens for digitization. Managing orders, posting payments and processing returns: Swiss Post Solutions takes care of these processes for Blancheporte, a mail order company in the 3Suisses Group. Asendia sends customer magazines to ten countries for Mercedes-Benz, and the Swiss-French joint venture contributes all of its international expertise and regional know-how to the process – including returns management and address optimization.